Kyokushin Karate is a traditional Japanese Martial Art, or Budo Karate. It was created in the early 1960’s by the founder Sosai Masutatsu (Mas) Oyama after his 30 year in depth study of various Martial Arts e.g. Chinese & Korean Kempo, Shotokan Karate, Judo, Goju Ryu Karate, Western Boxing etc. The International Headquarters (So Honbu) was opened in June 1964 at Ikebukuro in Tokyo, Japan and the name Kyokushin, meaning “Ultimate Truth”, was officially adopted. Prior to this it was simply known as Oyama Karate. In the Martial Arts circles, Kyokushin Karate is often referred to as “The Strongest Karate”. It is renowned for its rigorous training and conditioning, realistic body contact in sparring, the use of tameshiwari (breaking test) technique, heavy reliance on circular motion and disciplined, strictly traditional mannerisms. All the above, and in particular the use of circular movement in the execution of techniques, makes Kyokushin Karate rather unique compared to other Karate styles, which mainly rely on simple linear movement and non contact training. In summary, Kyokushin Karate can be described as being elegant and serene in its movements; refined and stable in its form; classical in its methods, beliefs and protocols, yet very relevant in the 21st century as an excellent method of training mind, body and spirit and a very effective means of self defence. The points of the Kanku represent the fingers and imply the ultimates or peaks, the thick sections represent the wrists and imply power. The centre represents infinity, implying depth. The whole Kanku is based and enclosed by a circle, representing continuity and circular action. Kyokushin Karate begins and ends with points and circles in which lies the strength and the life of the system. 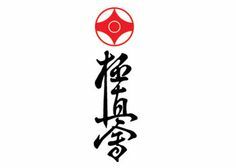 The characters for Kyokushin-Kai, found on the dogi (training uniform) of members worldwide. These characters were originally painted by Haramotoki Sensei, calligraphy master and friend of Sosai Mas Oyama. “The heart of our karate is real fighting. for a firm unshaking spirit. So that in time, our senses may be alert. we will seek to cultivate a spirit of self denial. and never foget the true virtue of humility. we will seek to fulfill the true meaning of the kyokushin way. Following the Martial Way is like scaling a cliff – continue upwards without rest. stemming from selfish animosity or thoughtlessness. and is mastered after ten thousand days of training. Grateful heart are truly abundant.